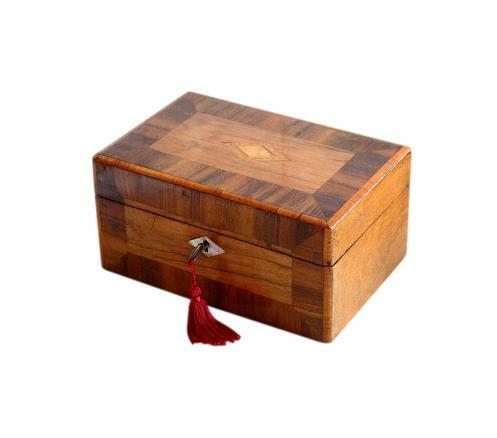 This is a very sweet, smallish, antique jewellery box. It is late Victorian/early Edwardian, and in complete original condition. 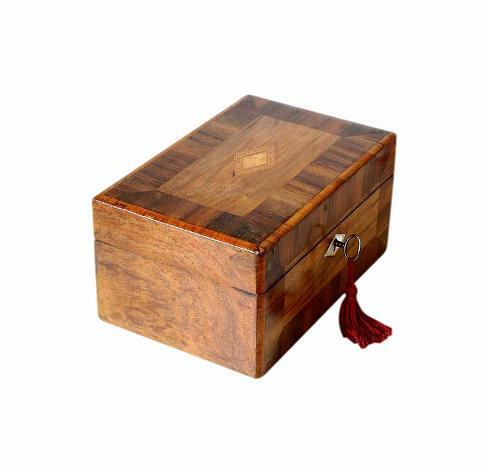 The lid and front have Walnut veneered panels, surrounded by broad Mahogany veneered frames. 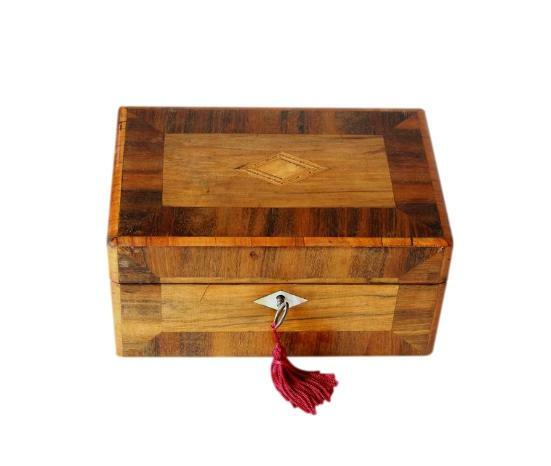 The centre of the lid has a beautiful inlaid diamond shaped cartouche, made up of various fruitwoods. The sides and back have a Walnut veneered finish. There is a beautiful Mother of Pearl diamond shaped escutcheon to the keyhole which compliments the cartouche on the lid. The box is complete with its original working lock, period key and 'stop' hinges. The stop hinges prevent the lid from falling back. The bottom of the box has a new felt covering which will protect the surfaces of furniture. Apart from this addition the entire box is in complete original condition. The interior is all original, beautiful and luxurious. 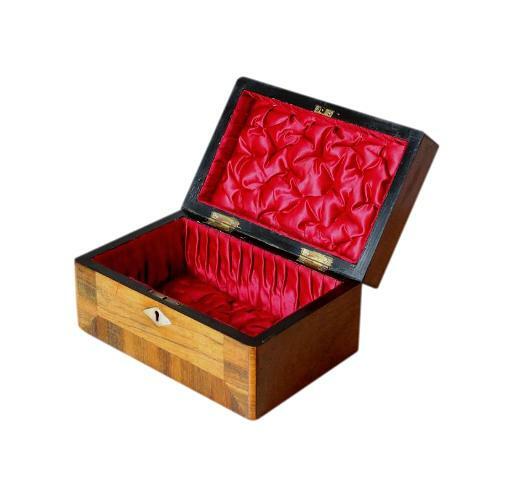 It has deeply padded, ruched, red silk panels, to the inside of the lid and also to the base of the compartment. It also has pleated red silk linings to the interior walls. This box is in lovely condition for its age. There are some minor marks and wear to the veneer as we'd expect on a box of this age. All of the inlay is present and intact. The silk is very neatly fitted and in superb condition despite its age. 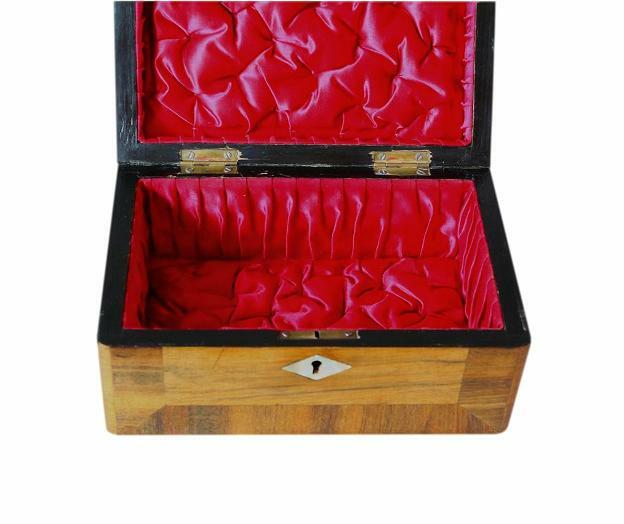 The box is of sound structure and its hinges and lock are in good working order. 18.0 by 11.0cm with a 6.0cm depth. International Postage is £25 by Royal Mail International Signed For postage. Delivery is fast, within 3-5 working days to Europe and 5-7 working days to the rest of the world.